The new Facebook profile has created an almost seamless flow of information from one area of Facebook to the next, but most people are failing to take full advantage. The first thing that I’ve noticed with literally every profile I’ve come across is that most people are not connecting their profile page to their business fanpage. If you are a business owner or the marketing director at your company, this can be extremely valuable and it will give your profile a much more professional look. At the very top of my profile it gives a quick overview of who I am. Where I work, where I went to school, where I live and my hometown, etc. Below that are the 5 most recent pictures I’ve been tagged in, and below that is the top of my wall. To the left is my profile picture and a navigation bar that lets people explore my profile more. Now if you take a look at the top portion again, you’ll see that each detail of the overview has blue text which indicates a link to another page. 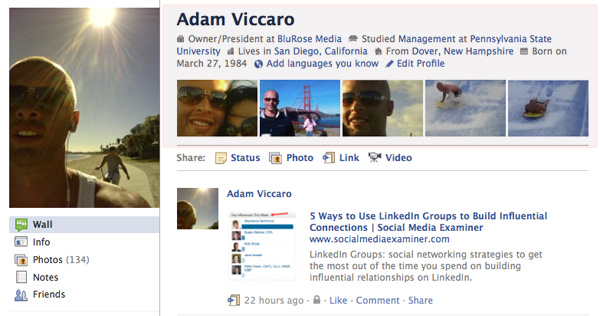 In fact, if you just hover your mouse over each link, Facebook will give you a quick summary of where that link goes. If you were to hover over the other links, a similar summary would pop-up and if you actually click on the link, you’ll be brought to that fanpage/interest page. You’re info page follows a similar format as well which you can see in the second image. If you are a business owner, this is great visibility for your business on Facebook and it adds a level of professionalism as well. When you don’t have this connected correctly, people may click on that link to see more about your company, and they’ll be taken to a random page rather than your actual business fanpage. Unfortunately most people don’t have their profile and business pages linked together properly. Fortunately this is extremely easy and takes all of a minute or two (as long as you already have a fanpage for your business). 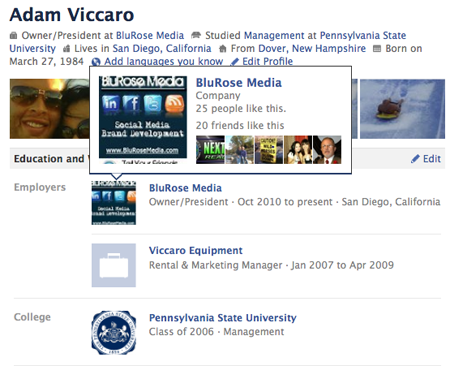 Once you have your page established, go to your profile and edit your “Education and Work” on the info page. When you enter your business information in under “Employer”, be sure to use the exact name of the fanpage for your business. As you type, options should show up for you to select, and you want to choose (by clicking on it) your exact fanpage. If you simply type the business name in, but you don’t select an actual fan page, Facebook may not make the connection between what you typed in and the fanpage. I’ve seen quite a few high profile business owners fail to do this with their profiles and it just goes to show how fast Social Media is changing. Facebook is making changes constantly, so it is tough to keep up, but keep checking back with us and we’ll do our best to keep you up to date on new Social Media tips & tricks. Be sure to share this post if you found it valuable!